At The Layar’s four-bedroom villa, stone slabs across a lily pond lead into an open-plan living room that flows around contoured and angled walls towards the garden. A few steps up is a mezzanine media room where a glazed wall looks down over the living area; tucked below is a guest bedroom. At one end of the living space is a raised dining area, beyond which is a breakfast bar and the fitted kitchen. At the opposite end is a sitting area open to the garden. A corridor leads to a guest cloakroom and second guest bedroom, while, discreetly tucked behind another feature wall is a third guestroom with doors to the garden. Across the lawn is a large swimming pool with a separate jacuzzi at one end and a spa with massage room and shower at the other. Beyond the Bengkirai-wood pool deck, and very privately screened behind another curved wall, is the master bedroom suite. The large split-level living room provides a perfect balance of sociable open-plan entertainment space and quiet get-away-from-it-all corners. On a raised platform of polished Merbau wood, a dining table for eight is separated from the well-equipped kitchen by a bar counter. On the lower level, sofas are arranged around a coffee table overlooking the garden and pool. Above is a mezzanine media room where sensually curved seating runs the full length of one wall. There’s more luscious lounging space in the garden, with oversized sunbeds languishing on the lawn and sun loungers and a circular love seat set on the pool deck. Submerged seating in the jacuzzi and shallow wings flanking the pool provide the perfect spots to stretch out and cool down. For sunset cocktails and alfresco meals there’s a dining table for six set before a barbecue cooking station. A curved display wall creates an imposing backdrop to the master suite’s king-sized leather-and-wood bed which faces a bank of wardrobes and a desk set below a wall-mounted TV. A corner banquette looks onto a small garden open to the bathroom, where there’s a terrazzo bathtub, vanity with twin basins, shower enclosure and second alfresco shower. Discreetly tucked off the living room in the main villa are the three large, air-conditioned, guest bedrooms, each with a unique charm. One is multi-level, with the king-sized bed on a raised Merbau-wood platform facing the pool, and a dressing area and large garden bathroom (with twin basins, indoor and outdoor showers and a bathtub) on the lower level. The two other bedrooms – one with a king, the other with twin beds – look onto their own corner gardens and also have indoor/outdoor bathrooms with bathtub, shower enclosure, and twin basins. Enjoy the exclusive use of the whole villa, its private swimming pool and unlimited WiFi and the flawless service of its team of staff, including the estate manager, The Layar’s head chef and his team, villa attendants, housekeepers, butlers and security. Book by 30th April for stays in April and June and receive 20% discount. – Only valid for new bookings received from 25th March to 30th April 2019. Take a well-deserved break this Easter and spoil your family with a luxury villa getaway. Book and stay for three nights anytime between 18 – 28 April 2019 and enjoy a complimentary Australian BBQ served in-villa. 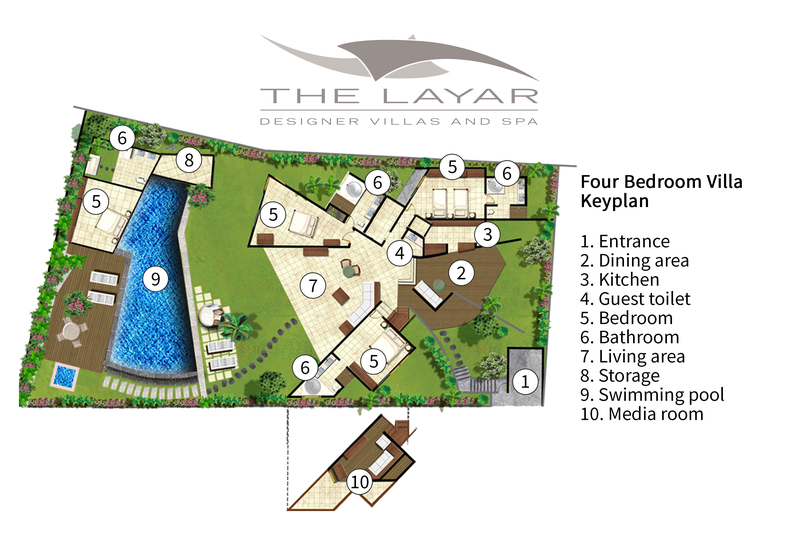 For a faultless fusion of inspired architecture and easy tropical living, The Layar is in a class of its own. This iconic enclave in the heart of Seminyak comprises 23 villas, each set in its own very private garden sanctuary fanning out from a central colonnade of mature flowering trees. An elevated setting means the villas’ front boundary walls all but disappear, creating a sense of openness and space that’s rare in this most popular of Bali’s resort areas. Design enthusiasts are sure to love The Layar – meaning ‘sail’ in the Indonesian language and named in tribute to the villas’ distinctive roofs that taper dramatically to the ground like the rigging of a traditional sail boat. These iconic roofs, which are the signature of The Layar’s architects, create exciting split-level open living spaces with curved and angled walls and contrasting natural finishes that include tropical hardwoods, marble and stone sourced from the Indonesian archipelago. The Layar offers a choice of one-, two-, three- and four-bedroom villas, each with its own distinctive design and all with an uncurbed feeling of space and openness. The one-bedroom villas are so romantic, yet even the largest four-bedroom villa has intimate, away-from-it-all corners. Pleasing to those who treasure their privacy, staff only appear when you need them; The Layar is run along the lines of a boutique resort – complete with central kitchen and room service – so staff are on hand to tidy or serve up a sumptuous breakfast or poolside barbecue, otherwise you’ll have the villa entirely to yourself. And if you can tear yourself away, Bali’s best restaurants, bars and boutiques are only moments away,including the resorts own stylish Settimo Cielo for some fine Italian cuisine.